And the exterior ain't too shabby either. 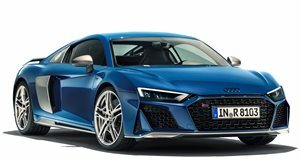 When Audi presented the all-new R8 V10 at the Geneva Motor Show this year, it was taking the next step into the big leagues. Preparing to fight some of the toughest luxury and performance vehicles in its segment, Audi had to find that delicate balance between crushing power, a tremendous driving experience and the beauty of opulence and indulgence. Now, taking this harmony to a whole new level, Audi Exclusive is presenting this incredible R8. A stunning creation on the outside, it only gets better when you step inside. Audi Exclusive has really gone all out with this design, dressing the R8 V10 with ten-spoke forged aluminum wheels with Y-design, a Carbon Gloss engine cover and sumptuous Santorini Blue paint. Step inside the car and you'll find an incredible interior, with Audi Exclusive's full leather package featuring Havana Brown leather, Piano Black finish on all other elements, diamond quilting on the seats and an Alcantara roof with black contrast stitching. The car is currently on display at Audi Forum Neckarsulm, and we think it might be one of the finest-looking, and certainly most luxurious, R8s of the new generation.